It’s been a long time since I wrote anything….. so here goes. Over the last 7 years I had decided that long course racing was no longer for me. I preferred the competitiveness of the short course, was excelling in my age group and enjoying the easier training with less injury. Last winter I got back into Half marathons and really loved the distance. I was able to race and train without much going wrong and improved my time from 1:40 in April, to 1:32 in October. After having that success, I decided to try a half Ironman again for the first time going long in anything since Boston of 2006. Musselman Half Ironman July 14th 2013 it is. It took a lot for me to press that “submit” button on my computer! But here it is 7 months later about to embark on my first long distance race in a long time. Training has been going great. 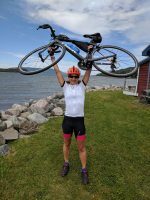 After a rough winter of bad weather and battling my ever chronic 15 yr old hamstring tendon tear, I managed to continue training and with a new diagnoses of a labral tear in my hip, I embarked on a yoga regimine that I believe has saved me. Twice a week at home for 20-25 mins Rodney Yee and I have a date. I have learned to love it and the fact that it is helping me makes it more palatable. I still do turn off the computer before he is finished his relaxation stuff:). Can’t teach old dogs new tricks. 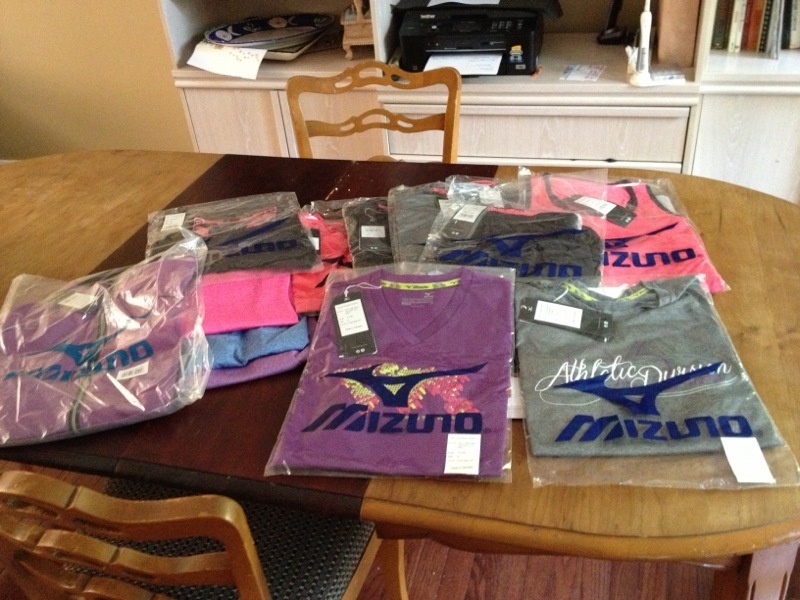 I have recently received a ton of support from one particular friend/contact at Mizuno. Shoes and apparel are appearing at my door on a regular basis. The stuff is awesome. I am running in a combo of the Wave Ekiden/Wave Universe for speed as well as the Wave Musha for some mid distance runs. Here is a photo of the last delivery. The stuff is awesome. Great light weight fabrics and fit is great. Nice and light for summer wear. I have two more weeks of training to go (well less than that now). A sprint race in Peterborough this week since my intended tune up was rained out at least for me! Then I need to be good at tapering which I never really am. But I feel ready to go so I need to make sure I am well rested going into the half. Then I will pray to the weather gods for no rain as rainy bike rides are never fun especially if you want to do a good PB. That’s the goal. Putting it out there….sub 5:30 or bust. 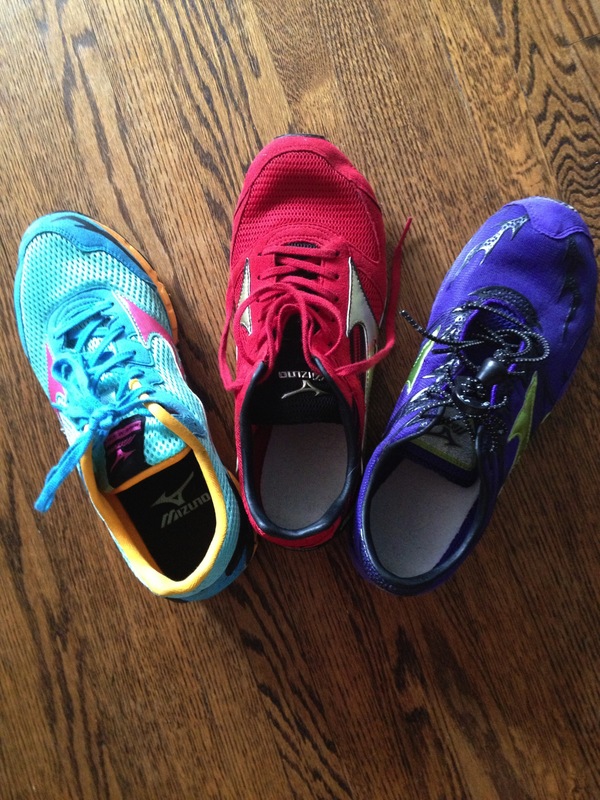 Here is my ever growing shoe collection: Mizuno has a great line up . Thanks for all the support. Will update after my Half Ironman next weekend.